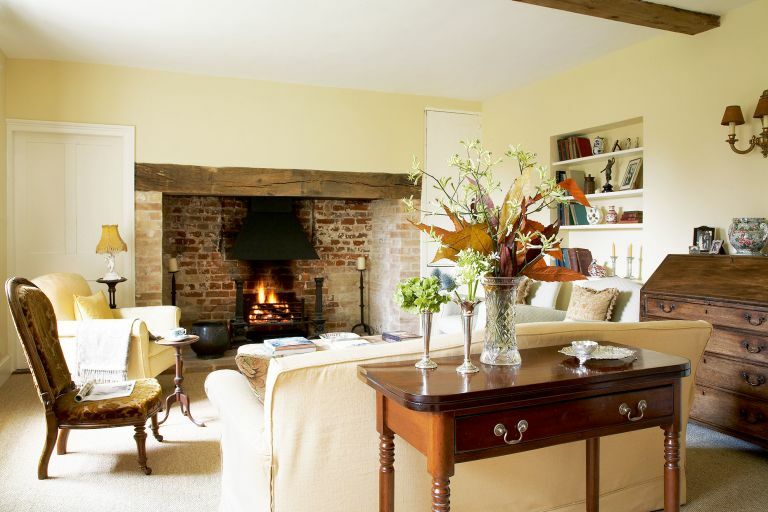 After renting in Norfolk for five years while waiting for the right renovation project to come along, Pamela and Jason Crawley finally found this Georgian farmhouse a few miles from Norwich in 2009. Enlisting the help of their son James, who is equally passionate about historic architecture, the family has completely restored what was a dilapidated house into one with period style and splendour. ‘We waited a long time for the ideal house in a peaceful location,’ says Pamela, ‘and when this one came up for auction two years ago, it suited us perfectly. It required a huge amount of restoration, had potential for an extension, and is set in beautiful rolling countryside on the outskirts of a pretty village. The house had a sound structure but had been unsympathetically modified in the 1950s and 1960s: there were metal windows everywhere, patterned carpets, ceramic tiled fire surrounds, no central heating or mains water, and cement render had been applied outside. ‘We wanted to ensure that the renovation was completed as authentically as possible,’ says Jason, ‘so it was imperative to save or replace all the features that had been damaged or lost. The family also spent a lot of time at salvage yards collecting bricks, floorboards, flagstones and timber beams – that had just the right amount of wear and patina – to repair the structural components damaged over time. The restoration was important, but the extension was an equally essential part of this transformation. It would give the house a large farmhouse kitchen, a formal dining room, a spacious entrance hall in the centre from which all the principal rooms are now accessed, and a master suite above. The latter comprises three interlinking rooms: the bedroom, a dressing room and a bathroom in between; by designing it this way, the dressing room can become an extra bedroom if required in the future. To ensure that these new rooms blend seamlessly with the original structure, the same meticulous attention to detail and use of old materials have been applied. "That visitors are often amazed that any part of this house is new is possibly the greatest compliment we could ever receive"
The smart country house style has been continued in the decoration, too, which further unifies the two halves. James chose a complementary palette of Farrow & Ball shades that range from light and airy off whites – such as White Tie in the kitchen – to those with a little more depth, for instance Light Blue in his own room, and Bone in the dressing room. The farmhouse has been complete for almost a year now, and Pamela and Jason are finally settling into their new home; thankfully, the dream they’d had for so many years has definitely lived up to their expectations. ‘Ultimately, we feel our home reflects the time, effort and passion that has been integral in every stage of this renovation project,’ says Pamela.